June 23, 2009, NEWARK, N.J. The co-founder of a Florida-based charter jet company, Platinum Jet Management, LLC (PJM) of Fort Lauderdale, Florida that operated a plane that crashed on takeoff at Teterboro Airport on February 2, 2005, admitted the company flew for a year without proper certification. Andre Budhan of Fort Lauderdale, Fla., pleaded guilty Monday to conspiracy to defraud charter customers and obstruct the Federal Aviation Administration. Mr. Budham admitted the Fort Lauderdale company, Platinum Jet Management booked and flew roughly 100 uncertified flights from 2002 through 2003. 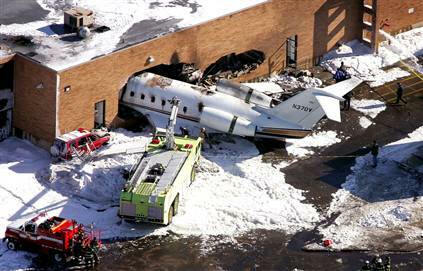 Mr. Budham is one of six defendants in the case, which resulted in an investigation of the Teterboro crash. The others defendants entered not guilty pleas. Budhan faces a prison sentence of 46 to 57 months. On February 2, 2005, about 0718 eastern standard time,1 a Bombardier Challenger CL-600-1A11, N370V, ran off the departure end of runway 6 at Teterboro Airport (TEB),Teterboro, New Jersey, at a ground speed of about 110 knots; through an airport perimeter fence; across a six-lane highway (where it struck a vehicle); and into a parking lot before impacting a building. The two pilots were seriously injured, as were two occupants in the vehicle. The cabin aide,2 eight passengers, and one person in the building received minor injuries. The airplane was destroyed by impact forces and post impact fire. The accident flight was an on-demand passenger charter flight from TEB to Chicago Midway Airport (MDW), Chicago, Illinois. The flight was subject to the provisions of 14 Code of Federal Regulations (CFR) Part 135, and operated by Platinum Jet Management, LLC (PJM), Fort Lauderdale, Florida, under the auspices of a charter management agreement with Darby Aviation (Darby), Muscle Shoals, Alabama. No one was killed in this crash, however, 11 people passengers and on the ground were.